27 new SciFi Weapons for your Game. If you buy the printed cards make sure you tick the Watermarked pdf and cards as you will then get the PDF free. The cards are US Poker-Size 2.5" x 3.5" with rounded corners, double sided, UV coated, you can mark off the rounds you have expended with a dry wipe marker. 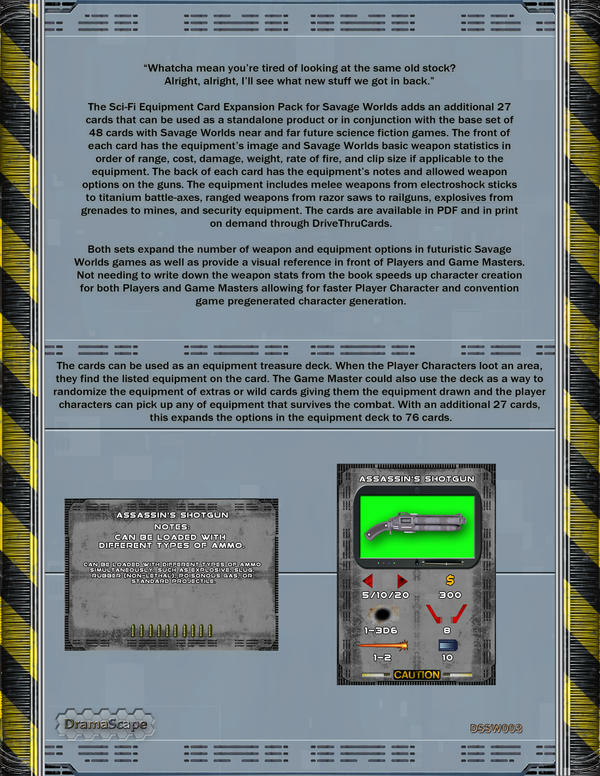 The Sci-Fi Equipment Card Expansion Pack for Savage Worlds adds an additional 27 cards that can be used as a standalone product or in conjunction with the base set of 48 cards with Savage Worlds near and far future science fiction games. The front of each card has the equipment’s image and Savage Worlds basic weapon statistics in order of range, cost, damage, weight, rate of fire, and clip size if applicable to the equipment. The back of each card has the equipment’s notes and allowed weapon options on the guns. The equipment includes melee weapons from electroshock sticks to titanium battle-axes, ranged weapons from razor saws to railguns, explosives from grenades to mines, and security equipment. The cards are available in PDF and in print on demand through DriveThruCards. 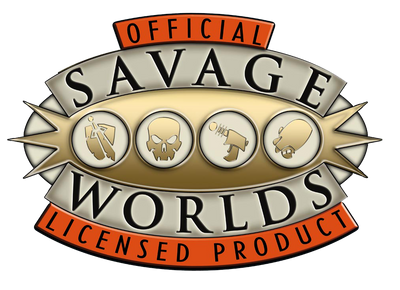 Both sets expand the number of weapon and equipment options in futuristic Savage Worlds games as well as provide a visual reference in front of Players and Game Masters. Not needing to write down the weapon stats from the book speeds up character creation for both Players and Game Masters allowing for faster Player Character and convention game pregenerated character generation. The cards can be used as an equipment treasure deck. When the Player Characters loot an area, they find the listed equipment on the card. The Game Master could also use the deck as a way to randomize the equipment of extras or wild cards giving them the equipment drawn and the player characters can pick up any of equipment that survives the combat. With an additional 27 cards, this expands the options in the equipment deck to 75 cards.